Readers are encouraged to email questions and suggestions for inclusion in updated versions of each paper (i.e., the paper ceasess to be a static entity but may change with time and input from both the author and others). The additions of such "peer discussions" should allow clarifications and improvements to a paper in a way that can be superior to anonymous "peer reviews" where anonymity sometimes invites abuse of the review process. New! Dell'Osso, L.F.: Interesting Effects of a Monocular Epiretinal Membrane and Developing Cataracts in the Infantile Nystagmus Syndrome. New! Dell'Osso, L.F.: Clinical INS Assessment to Determine Maximally Effective Therapy: What can the Physician Apply from the Bench to the Bedside? Dell'Osso, L.F.: How Someone with INS "Sees" the World and How to Clinically Assess Therapeutic Improvements in Visual Function. Wang, Z.I., Dell'Osso, L.F., Abel, L.A., and Cham, K.M. : An Open Letter to the Editor of the NEJM. Wang, Z.I. and Dell'Osso, L.F.: Behavioral OMS Model v1.4. Dell'Osso, L.F.: The Benefits of Extraocular Muscle Surgery in Infantile Nystagmus Syndrome. Dell'Osso, L.F.: Responding to More than a Response: Tenotomy Improves INS Waveforms. 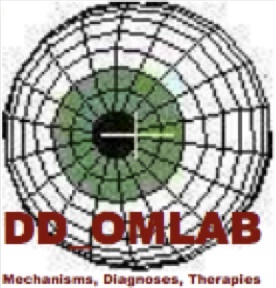 Dell'Osso, L.F.: Original Ocular Motor Analysis of the First Human with Achiasma: Documentation of Work Done in 1994. Dell'Osso, L.F.: Nystagmus Therapies: Types, Sites, and Measures. Automated, Updated & Expanded (2-D NAFX)! 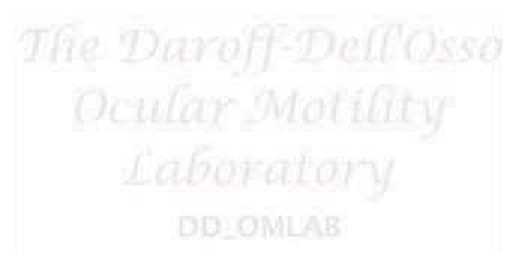 Dell'Osso, L.F.: Using the NAFX for Eye-Movement Fixation Data Analysis and Display. Dell'Osso, L.F.: Recording and Calibrating the Eye Movements of Nystagmus Subjects.